Hunting the Manitoba prairies...free-lance style. With few ducks in the area, the honker call became a critical tool. It was a fast-paced morning from the get-go. After abrupt, motel parking lot introductions to our hunting partners, Mark Voght and Ben Parmater, we hit the dusty trail in hot pursuit of our leader, Dan Neumann. The half hour rat race under starlit skies through the gently rolling Manitoban countryside ended in an expansive, just-tilled barley field. With relatively little conversation, and even less time to waste, we got right down to business, hustling decoys and stubbling blinds. It was easy to see we'd all been to the dance before. Veterans of the goose wars every one, each of us did his job. Only with the rig set and the trucks on their way out of the field, did young Ben and I at least, have time to catch our breath. But only as predawn's first neon glow began to slice the prairie free from the night sky did we realize something was missing. 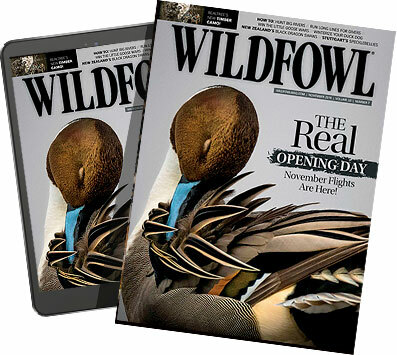 A common occurrence on most prairie hunts, the spine-tingling sound of at least a few unseen, whistling duck wings&apos;¦ those of hungry, early risers, ever-eager to greet the day, and often willing to bomb the set in a deck-scraping, up-close-and-personal rush&apos;¦ was nowhere to be heard. Soon taking its place however, was the unusually early, but oh-so-sweet sound of goose music. Apparently anxious birds on the distant roost began to gabble, their vocalizations&apos;¦ chatter enhanced no doubt by the still, clear air&apos;¦ growing ever louder. It was a single goose that foretold of things to come. We couldn't see it, as the rhythmically-honking bird first found our field, then, after a couple wide passes, our set. Finally, but eerily materializing out of the inky blackness, the loner lit confidently in our landing pocket, not 10 yards from where Ben and I calmly, but suddenly silent, stood. It was more than my aging yellow dog, Tanner, could stand. Spinning his wheels in the soft, plowed ground; he charged the hapless bird, sending it on its startled way just as the rest of our crew finished their hike back to our setup. Hunkering down into our blinds only minutes before shooting time, the first flight of geese, as if they were on the payroll, began to wing our way from the west. Then, without so much as a precautionary swing, they were on us! A flock of lessers, 40 or 50 strong, hanging on backpedaling wings, their black feet out, ruddering the air and searching for what they apparently felt was their piece of the prairie. The shot was called. Guns spoke. Geese tumbled. Retrieves&apos;¦ mere pickups really&apos;¦ were made. The hunt was on! But there was no time to admire our work. The sky had come alive with the marvelous sight and near-overwhelming sounds of geese&apos;¦ dark geese of every shape and size, ranging from the bomber-sized local honkers, on down to the diminutive, cackler-class "squeakers"&apos;¦ all stringing our way. Though slightly more cautious in the day's gathering light, almost all of the birds were ready to work the freshening breeze, determined to feed where they happily had for the better part of a week. The gunning was classic, in-your-face easy, and in the span of just four decoying flocks, and less than an hour, our work was done. Sitting back to enjoy the show while it lasted, I couldn't help but notice young Ben. There was simply no wiping that grin from his face. While it had been a great one for all of us, the short, fast&apos;¦ almost too fast&apos;¦ hunt had no doubt been the first of its kind for him. And he was soaking it all in, obviously loving every minute of it. Tanner, eager for the next flock to take a closer look. We'd gotten the idea from Dan Neumann, who we'd met at the Ducks Unlimited Great Outdoors Festival in Oshkosh only a couple months earlier. A transplanted Minnesotan with Canadian resident status, Dan was nothing if not enthusiastic as he spoke of the waterfowling he enjoys in his new homeland; and which, as a budding outfitter, he'd like to share with fellow enthusiasts. Dan had invited us to hunt with him if we got the chance, and that's part of what we wanted to accomplishment. But ours was to be a fact-finding mission first and foremost. We wanted to look, see, and hopefully feel what this country had to offer while doing a little freelancing. To that end, we went well-equipped with Jay's substantial decoy rig in tow. Field hunting, primarily for the ducks that should have been abundant by the time of our late October departure, was our first priority. But we had the waders and a set of floaters should we encounter some promising potholing as well. So, with that as-good-as-it-gets goose hunt in the bag, we set out to put in some "windshield time" late that first afternoon, the plan being to find a hunt for the morning. Mark and Ben, our newfound buddies, had the same agenda. Comparing notes over dinner, it turned out our results were roughly the same. There seemed to be a general scarcity of ducks, (thanks no doubt to the unseasonably mild, late October weather that allowed the birds to comfortably linger farther north), and neither of us found an area that held geese in numbers anywhere near the one we'd hunted that morning. So there was little choice. It was back to the well for the four of us. Setting up in the same section, but on a different field we'd seen feed birds the day before, we were confident, half expecting a repeat of day one. But unlike the previous day's unusually early, urgent flight, shooting time, and even full daylight came before this morning's first geese took wing, then only to pass us by with nary a look. "This is gonna' be a different story," Mark announced with no small amount of concern. Since we had little choice we stuck to our guns, flagging and calling to every one of the small flocks from the unexpectedly diminished overall morning flight, which only gradually developed. Our shooting opportunities were fewer and much farther between. But we hunted well, and made the most of each one, eventually taking 10 birds in what amounted to a good, yet challenging hunt. Though not spectacular, the morning, like any, was not without its moments. I don't know why I did, but minutes after Tanner had returned with a cackler following one of our shooting escapades, I decided to look the bird over. It wore jewelry! So I held it up for everyone to see. Ben, quite the strapping young man at well over six-foot and sporting a stubbly two day old beard, remarked with an awestruck, almost childlike look on his face. "Oh man! That's only the second banded bird I've ever seen taken!" Already having served an extended tour in Iraq, and likely looking at a second, there was no question in our minds. That band was his. "Thanks," he simply and politely offered. To which we countered, "No bud, thank you!" The boys from Iowa had to head back stateside that afternoon. But we got back on our horses, setting out on an expanded surveillance tour, the results of which were again, unexpectedly dismal. Dan's scouting efforts pretty much mirrored ours. With customers coming in that afternoon he decided to move his base of operations an hour or so south, suggesting we might do the same. Following suit, the next morning found Jay and I windshield-bound once again. Definitely part of the game, especially when freelancing a new area, scouting can easily occupy half your time or more. And such was the case with us. But aside from being necessary, we find it thoroughly enjoyable to simply cruise prairie side roads soaking in new sights, especially when they include fowl. Our effort this day was particularly rewarding since we soon found a nice wad of geese, along with a fair sprinkling of mallards working a secluded field of wheat stubble. Better yet, we were able to locate the landowner who was more than happy to let us "Have at 'em!" Still committed to the recon portion of our trip, the plan was to spend the rest of the day touring, and further familiarizing ourselves with the turf; then rescout our field late in the afternoon to finalize our plans for the next morning's hunt. But after bumping into Dan at the local café during lunch, our program abruptly changed. "I've got my guys on a decent snow goose hunt, and they're staying in the field all day. But I've found a great Canada hunt for this afternoon. Thought maybe the three of us could give it a shot?" he questioned. The unbridled enthusiasm in his voice was contagious, and it didn't take much to twist our arms. We pulled into the stubble field by 3:30 and after locating the goose turd-studded "x", had the rig set in no time. Deployed on a comfortable, soon-to-be shaded hillside, with both the sun and the wind at our backs, it couldn't have been a better setup. And with a small lake below us, backgrounded by rolling, wooded hills, their scattered popples clinging desperately to the season's last golden leaves; I'll be darned if I'd ever seen a prettier one. Just as the sun started to slip behind the rim of the hill, the year's fullest moon began to burst over the eastern horizon. Within minutes its full-blown presence in the darkening, but still azure and cloudless sky seemed to trigger the afternoon flight, as roost waters to the southeast began to spew ragged lines of low-winging dark geese. "Geez," Dan muttered sincerely, "There's a ton more birds than I thought there were!" With no less than all of them headed our way, things started to pop. Wave after shootable wave of hungry geese washed over us, with singles, pairs, and small flocks swinging in tight, only to flare back out at a trigger-tempting 15 or 20 yards. Sensing it was a special time, none of us were willing to call the shot, for fear no doubt that it wouldn't be right for all of us. And if we were battling our nerves, it was nothing compared with our individual skirmishes with the dogs. Tanner, my nine year veteran of countless prairie hunts, spring and fall, was acting like this was his first time at bat. Jay's Buddy was about to bust his dog blind down, and Dan's tightly-wired pup, Jack, was acting every bit his age. With yet another kamikaze single hanging in his face I finally broke down, telling Jay to "Take 'em!" which he promptly did, much to Buddy's relief. And that's pretty much how we managed the hunt, each of us calling gravy shots for the other. Finishing four birds short of a combined limit, taken from the many times more we could have easily shot, made for a low-keyed yet truly classic hunt, satisfying to a degree few ever match. The author is all smiles after finding this hidden gem. Having that wouldn't-trade-it-for-a-thing shoot in the bag, we were faced with a bit of a dilemma. Gunning that afternoon, instead of scouting, meant we'd have to hunt our spot cold turkey the next morning, which we did, with predictably miserable results. Our geese were nowhere to be seen; our mallards wanted the other end of the half-mile long field. Leaving the goose spread temporarily afield, we tried to cut our losses by taking off on a mid-morning scout. We'd made the call just early enough to find a snarl of mallards working an undulating stubblefield edged by no less than three potential roost lakes. They appeared to be those typically hard-to-hunt, late season local ducks. Whirling and looking, they'd touch down for an instant, then explode in a swarm of flashing underwings, only to search tentatively and indecisively again, never really settling in for any length of time. Since we had no other options, when the landowner readily granted permission, our fate was sealed. It seemed we'd no sooner picked up our substantial decoy rig from the morning's fiasco, we were at it again late that afternoon, deploying an even grander affair, complete with several dozen full body mallard field blocks. But instead of ducks, disappointment reigned. Oh, the birds showed up alright, just at last light. But, save for a solitary greenhead on which I whiffed, the well-educated birds wouldn't come close to working. Though not a bad one by any means, it had been a long day, remarkable mainly for its decoy drills, and the fact that we likely screwed up again by not scouting for our last morning's hunt. But then, making questionable calls and second guessing ourselves is just part of the game. Running into Dan and his crew at the pub that evening, and after relating our sad tale; we were graciously invited to join them in the morning, our last, for a go at "whitey" and, hopefully, a few ducks. Not being too proud, we were glad to accept. Applying six of us to the task, we pretty much emptied Dan's 24 foot trailer, setting a mixed rig of dark geese, snows and ducks. It was, by our standards at least, a pretty convincing-looking set. But the windless, severe-clear skies that greeted the brilliant dawn spelled our doom. ing over wing toward us. Things were looking up, at least for a minute or two. But, as so often happens in years like this one with few juveniles in the flock, the white geese hit the wall at 200 yards, only to grab altitude and sail on by; wisely recognizing ours for the decoys they'd seen countless times before. Frustrating? You bet! But how can you blame 'em? It's how those spectacularly wild birds make their living! The ducks, fortunately, cooperated a little better. Using a half-mile distant pond for drinking water, the relatively small number of mallards and a sprinkling of pintails that had come with the snows from a more distant roost, would sporadically jump in small bunches, giving us an occasional, but oh-so-suspicious look. They weren't the hungry, hell-bent-for-leather, readily-decoying migrants we'd expected to encounter. But we were thankful for their limited participation just the same. Reflecting on the week past during the drive back to reality, we agreed the trip had not been what we'd bargained for. While we'd certainly had our share of would'ves, could'ves, and should'ves, it's fair to say the ducks let us down. The dark geese, which we'd at best hoped to be a possible bonus, proved another story. Heck, they were THE story. But those really in the know (guys like Dan Neumann) will quickly tell you this shouldn't have come as a surprise. "Our gunning for ducks and snows&apos;¦ when you hit it right&apos;¦ can be nothing short of special. But it's the dark geese&apos;¦ day in and day out&apos;¦ that are the area waterfowler's bread and butter," according to Dan. As adventures go (aside from being yet another good one), ours was a matter of "live and learn." The fact that it was those "big 'ole blackfeet"&apos;¦ as I've often heard otherwise dark goose-deprived, visiting waterfowlers so fondly refer to the Canadas of the northern prairies&apos;¦ that saved our day, our week; was a lesson we'll not soon forget.